The annual ratings of customer satisfaction with mobile phone manufacturers will be released by the American Customer Satisfaction Index Tuesday morning, and for the first time, feature phone makers will be judged right alongside smartphone makers, who are newcomers to the list. It’s not totally surprising, but Apple (s AAPL) makes its debut on the list at the top with a score of 83 out of 100, while languishing RIM (s RIMM) sits in the cellar with a rating of 69 out of 100. The average for the industry is 74. What should be noted by both the makers and buyers of all kinds of mobile phones is just how hard it is to make a smartphone that people enjoy owning, as compared to basic calling and texting devices. The ACSI gets its results from calling consumers at home and asking them a variety of questions about any mobile phone they’ve purchased in the last two years. The main points the survey covers are customization — how well does a product suit the owner’s individual needs — and reliability — how often something goes wrong while using the product. On one hand, smartphones have more features and have more to them, so you’d think that would be a better experience. But that’s as along as everything’s working correctly. When you add more layers of complexity, you create more opportunities for things to go wrong. 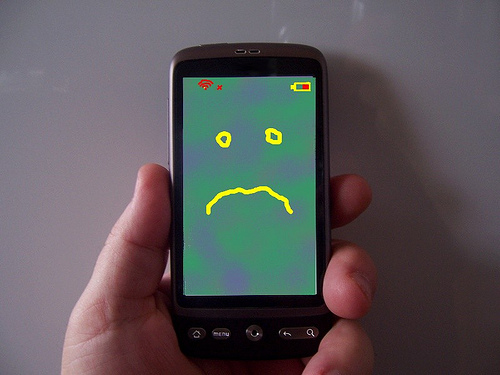 For a basic phone for calling, the only thing [that generally goes wrong] is dropped calls or lack of signal. You add texting, there’s another layer, but … When you add in data you add in how fast is the download and upload speed. There are many more issues. While smartphones score better in the ACSI in terms of customization, their reliability marks can drag them down. Many more things can go awry with a smartphone compared to a feature phone besides data or signal issues common to all phones: apps can be wonky, syncing content can be confusing, mapping or navigation can be hard to use, etc. 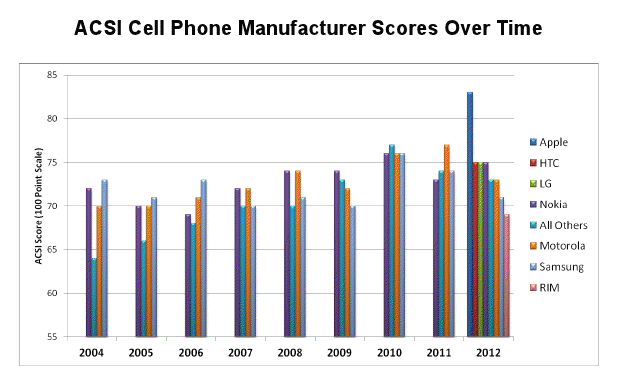 That is why smartphones overall score somewhat lower than basic phones, according to Van Amburg. “So when you look at our data, it makes Apple’s ability to be as high as they are that much more impressive,” he said. After Apple, the leader among all mobile phones with 83, comes HTC, LG and Nokia (s NOK) tied with a score of 75, Motorola (s MMI) and “others” both coming in with 73, Samsung with 71 and RIM with 69. The comparisons are not entirely parallel: Apple and RIM only make smartphones. The rest dabble in a mix of both feature and smartphones. But as smartphones continue to outgrow feature phones in popularity, the need to continually improve and upgrade the product and customer experience for these almost indispensible devices should be very apparent to these manufacturers. And how do they improve their customer satisfaction rating? The obvious ways: make more reliable products that are easy to use and that people feel are representative of their needs. But that’s harder to do for some than others, says Van Amburg. Ask to a smartphone user who sccores 70 point if he would change its smartphone for a feature phone, I bet I know the answer : ” Never …. ” . Once a user gets a smartphone, he will never gets back to a basic phone. why did they wait till 2012 to start including Apple?